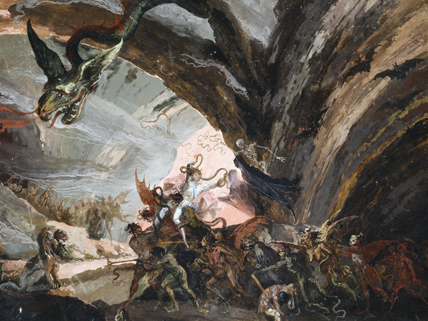 Over the centuries, numerous artists have depicted the underworld. Pluto and Harlequin in Hell, shown here, was painted between 1820 and 1840 by Giuseppe Bernardino Bison. Perhaps you have read ancient Greek myths about Theseus, Odysseus, or Orpheus and the heroes’ danger-filled journeys to the underworld. Although the stories are fiction, the Greeks and Romans who spoke of the dark realm ruled by the god Hades (or Pluto) had in mind an actual place, with a physical entrance. This “mythical” gateway has now been located. It doesn’t lead to the storied land of torment, but its dangers are real enough. Italian archaeologists recently announced that they have found a cave in Turkey that, long ago, the Greeks thought led to the underworld. It is near the ancient city of Hierapolis, a UNESCO World Heritage Site, founded more than 2,200 years ago. A place of religious pilgrimages, called the Ploutonion (“the place of Pluto”), was described by several ancient writers. These chronicles tell of a cave with air that poisoned any living thing brave or foolish enough to enter. Because it was so lethal, people thought the vapor was sent by Pluto, the purported god of the underworld. Animals were sacrificed by leading them into the cave and then dragging them out dead. Only priests could descend into the cave and emerge unharmed. Even near the cave, some people who gathered for religious rites had visions and prophesied of events to come. Until recently, these stories were unsubstantiated. The excavations now tell us that the gas was carbon dioxide seeping out of the ground naturally. In dense concentration, CO2 is lethal. In fact, the archaeologists observed birds that flew toward the cave’s opening for the warm air fall down dead. Even a strong, nonlethal whiff can cause hallucinations, which in ancient times gave rise to prophecies. The priests who had ventured into the cave knew either to hold their breath or move carefully between oxygen pockets. The site remained functional until the 4th century AD. About 200 years later, it was destroyed by Christians. Earthquakes probably completed the site’s destruction. Along with reading the full story, you can see a digital reconstruction of the Ploutonion and several other photos of the site. Get some background on the Greek god who supposedly sent forth the poisoned vapors from beneath the earth. Here’s everything you might want to know about the archaeological excavations in Hierapolis, in western Turkey. Read it in Italian, English, or Turkish. For all of you saying, “hi”, this is actually fascinating. I mean really, now we know some of the truths and how they thought back in the Ancient Greek time! I love this and will be showing this to all my witty Greeky(greek geek) friends! One time I ate cheese that was white! I think that it could be a place that could be his test for people who want to go to the under-world. Maybe we could find priest and send them to discover the cave and see what’s inside.